Another day I was meant to wake up and leave early – but didn’t. I am quite comfortable in the tiny bungalow, small as it. Even with the air-conditioning off the place doesn’t get too hot – and with all my things installed in just the right place, emerging from my cocoon is a surprisingly tranquil affair. But taking care of the emails, Facebook postings, etc. has me finally leave the room at 10 pm, which seems a bit ridiculous. No, I wave off the enthusiastic tuktuk drivers and old city bus drivers, not that the drivers are ever that aggressive here. I manage to locate the buffet eatery again and eat two tasty dishes, waiting for my new-found American friends at the next table to finish up so that we can share a tuktuk to the bus station. I really could walk but for the 20 baht I may as well conserve energy. A minor melodrama arises at the bus station, the young woman at the Wintours ticket booth unhappy to be distracted from her cell phone, then dismissively waving me in the direction of quay 15, where the Chang Rai bus is to be departing from. The young man seated at the small ticket table on the platform is also hunched over his cell phone, texting, and is not too pleased that I interrupt him to buy a ticket and reconfirm that the Chang Rai bus will in fact stop in Si Satchanalai. At the tourism police officer, a yellow-shirted young man is eager to help me, but it becomes quickly apparent that he has no idea what I am talking about when I try to find out what the return schedules of the buses are from Si Satchanalai. He insists on going to the Wintours wicket, where the young woman I spoke with earlier on is now somewhat more engaged, which is good, considering that I don’t want to repeat the fiascos I went through when I traveled in Malaysia. When I probe her for the right Thai words to say, she and her friends break out in big smiles. The coffee shop to the back of the bus station is nothing more than a general corner store-type outfit with the general mish-mash of foodstuffs, and with nothing more invigorating to drink than the hated Nescafe. Not that there really is any reason I should be drinking coffee anyway, but bad habits don’t die easily. The bus ride is smooth enough, and the air conditioning just a bit too aggressive for my own liking. As is typical in the tropical countries, people around me try closing the curtains to block the sun and heat out, not that it would bother a tourist from the northern climes such as myself. Happily, the bus is not overloaded, but I have the feeling that the public transport infrastructure is functional enough to not be in constant crisis mode as would be the case in a country such as India. Leaving Sukhothai, the urban sprawl dissipates but we are not entirely immersed in forest, rather, agricultural plots amended by small settlements of picturesque two-story wooden bungalows painted in natural tones with pattered eaves, large crafted window shutters and broad verandahs, sometimes raised off the ground on stilts, crouched amidst a mesh of green. 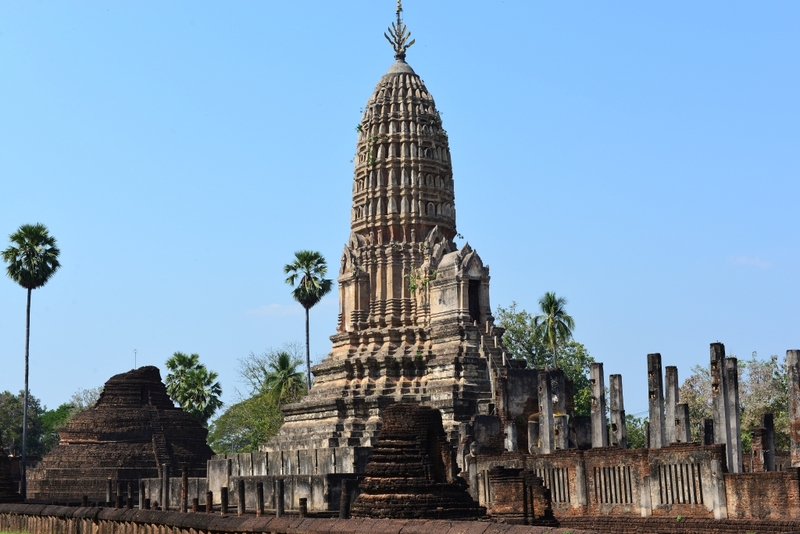 As the urban congestion returns and the bus seems to be stopping every hundred or so metres, I shake my head in dismay – given how early in the afternoon the last bus back to town returns, I will not have a lot of time to see the sights at Si Satchanalai. I have almost lost interest when the conductor comes to my seat and instructs me that my destination will soon be arriving. 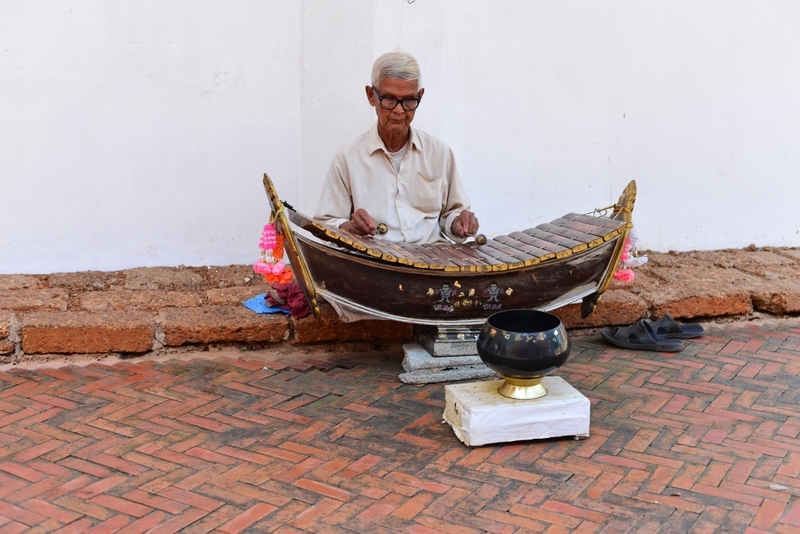 An older man greets me as I get off the bus, pointing to the arch through which the road to Si Satchanalai passes, then to the bicycles he is renting. The bicycle he passes me may not be perfect, but I have no idea if there is any competition, so I may as well take it. A short jaunt down a back lane and then the tension of trying to balance on a narrow, swinging wooden slatted suspension bridge, swaying slightly over a slow-moving river below, opening up to a stunning vista around me. I dare not slow down or look around for fear of losing my balance and matters going very wrong. Immediately on the far side is the Wat Phra Si Ratanamahathat Rajvoravihara complex of new and old temples, the ticket gate marking the main road on the other side of the river, a small parking area the gathering point for the few automobiles and bicycles of visitors, a small shop of relevant knick-knacks next to the ornate soaring gable of the modern vihara, an older man cross-legged in front of the adjoining mandapa, playing hypnotic notes on a type of marimba. 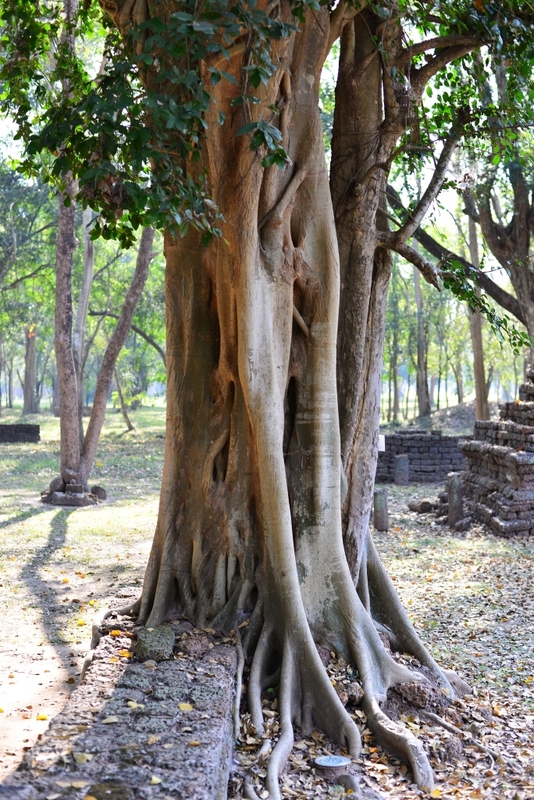 The mandatory bodhi tree wrapped in golden cloth stands on a field covered in a carpet of crackling leaf litter, beyond which is another large new golden and cream temple structure. 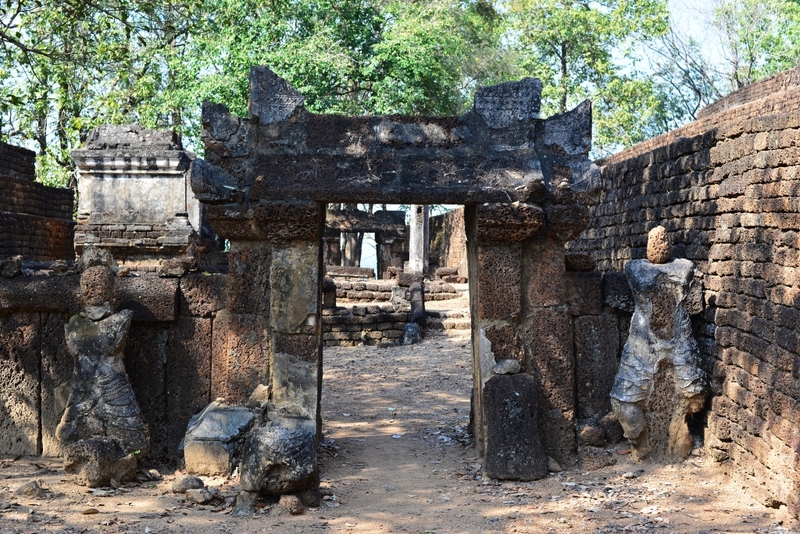 The weathered dark brick of the ancient Sinhalese-influenced structures are enclosed in a low wall, the columns of the original vihara leading towards the golden-enshrouded gigantic seated Buddha with the hand position (mudrā ) in that of ‘Buddha subduing Māra’ (the demon who tried to prevent him attaining enlightenment), common in the region. 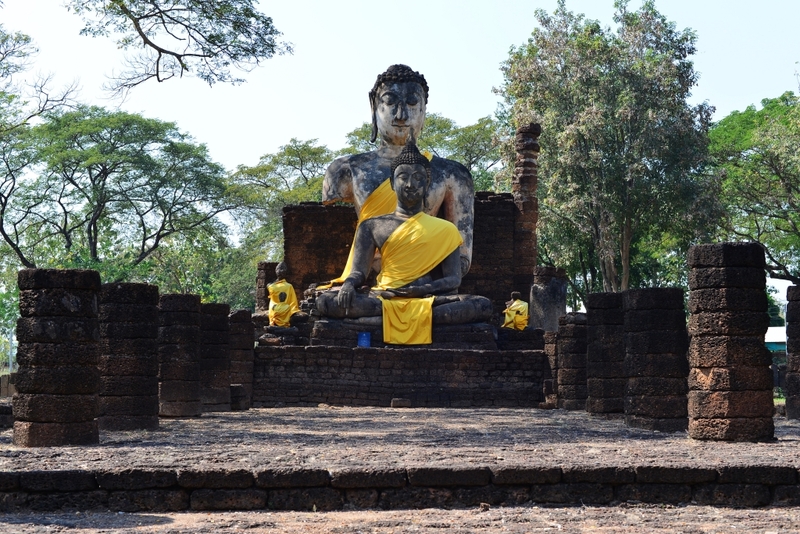 The faceted tower of the prang soars overhead, steep staircases leading to raised porticos above the seated Buddha figure. The principal complex of Si Satchanalai lies further along the river, several smaller temples lying fallow amongst the seeming prosperity of gently tended wooded lots rich in green, stolid wooden bungalows in earth tones, a few small shops in front of which the owners sun themselves, waiting for business, and a tiny cafe at which a woman labours at my cappuccino, the neighbors’ feral dog barking ferociously at me from its cage, canines bared, the beaming owner of the house coddling a small child in his arms and welcoming me. 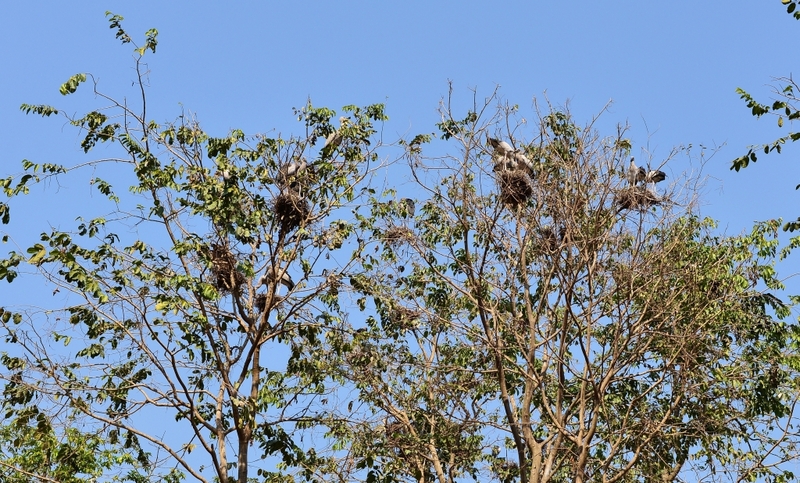 Across from the row of stupas and the adjoining vihara at Wat Khok Singkharam I find a lodge with bungalows sprawling amidst the tropical foliage, a group of older male Caucasians and their much younger local female consorts entertained by the antics of a pair of caged gibbons. Two older Thai women sit in the shade on the temple’s stone barrier, contemplating the tiny child squatted on the lot across from them. 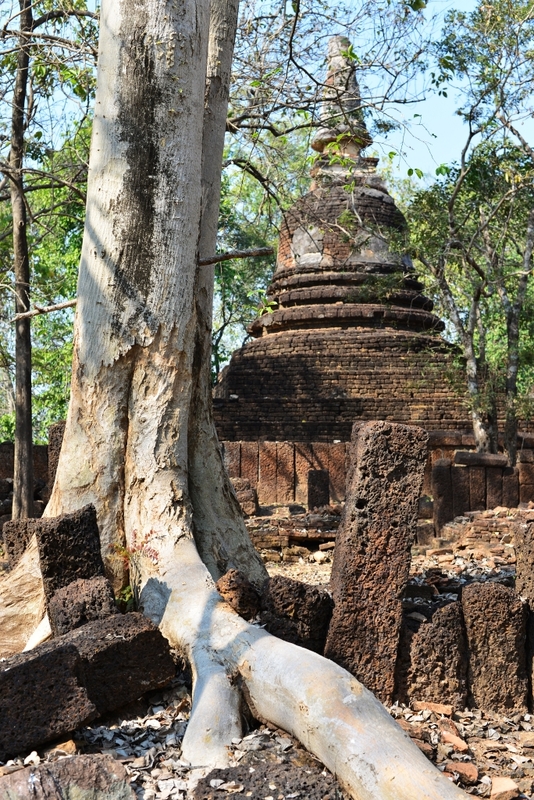 The thick trunked trees arc dramatically across the geometry of the ancient temple, and then I am off to the central enclave of Si Satchanalai, which proves to be as dramatic as anything I have seen in the country. 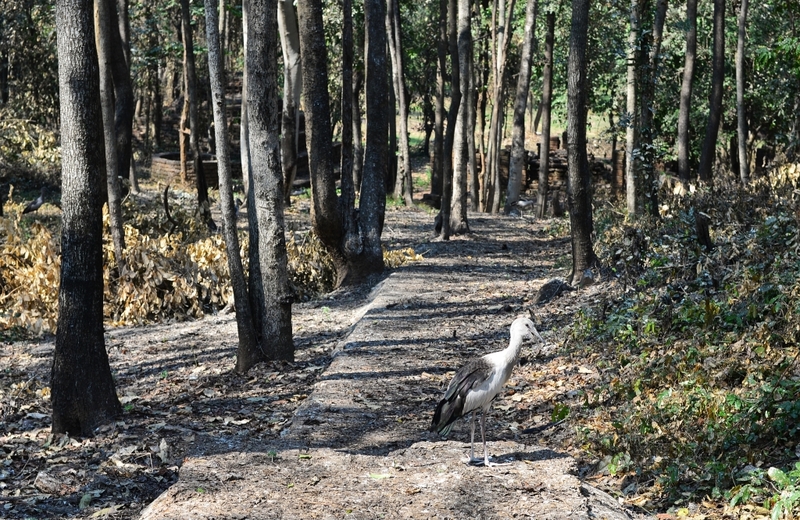 I glide along the quiet lanes past the darkened spires of a prior era to the far side of Si Satchanalai, where several temples are situated on the crest of hills, through the bustling flock of egrets whose loud chatter fills the air and whose nests consume the canopies of the forest surrounding the hill temples. The air is rank with the smell of the bird, the ground whitened with their feces, and the copious amount of not just feathers but entire bloodied wings and tails evident on the trails displays the competitiveness that we inherit from the animal kingdom. 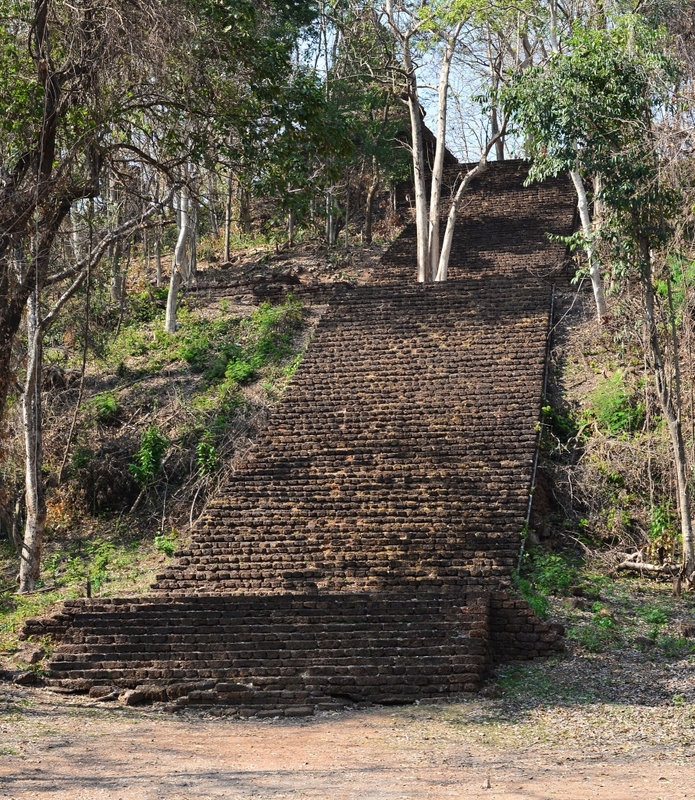 The broad stone staircase leads up to pleasant vistas of the surrounding dry tropical forest, a weathered stupa, a large orange-enshrouded Buddha, and a path splattered with egret remains, a few of the birds tentatively flapping in the vicinity of the trail, unsure as to their safety in my presence. I cover my nose to avoid inhaling the toxic cloud emanating from the excrement blanketing the area. Wat Khao Suwankhiri on the adjoining hill is far grander, although the enormous chedi looming overhead is as always difficult to capture photographically against the light. It seems that all the best compositions are always against the sun, the temples deliberately or coincidentally built to face eastward. 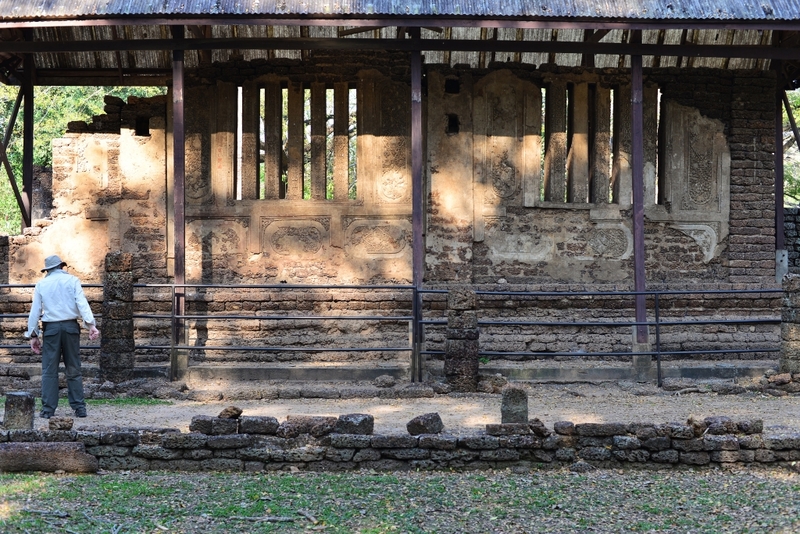 The thick roots of the majestic hardwoods twist sinuously amongst the helpless ancient walls, the remains of which delimit a large and multi-roomed assembly hall adjacent the stupa. 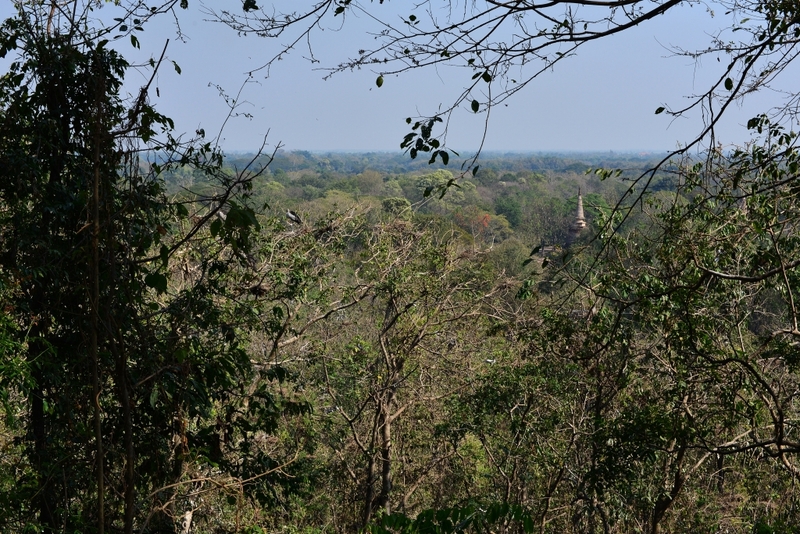 The young Englishman I had seen rushing by at Sukhothai now appears, scurrying along the temple side, barely acknowledging me, and then is gone again. Troops of workers travel from one temple complex to the other, bodies enshrouded to the point that it is impossible to tell whether the small figures are men or women. On the broad lots of the temples they busily sweep with their straw brooms, ridding the grassy terrain of leaf litter that provides a perfect home for snakes and all sorts of other nasties. 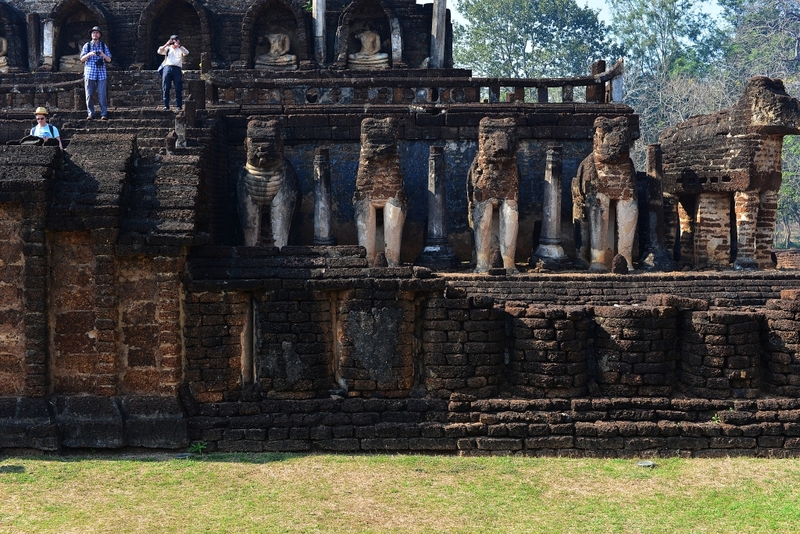 And these poor folks have a lot of work on their hands, considering the enormous terrain the temples cover. 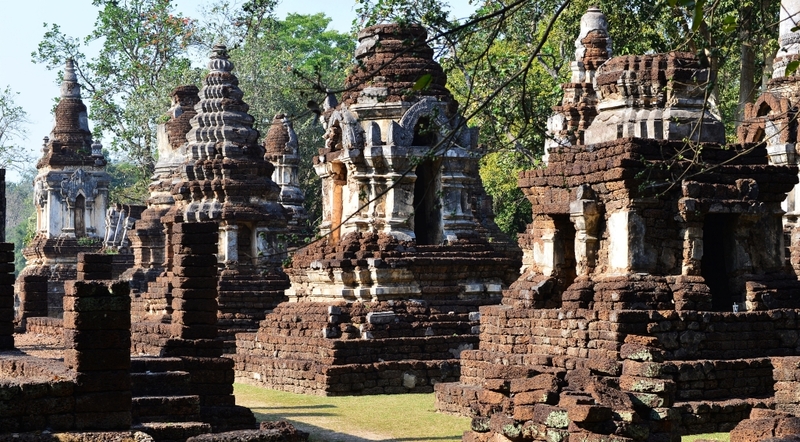 The regal temples at the centre of the site showcase the spectacular majesty of Si Satchanalai, the stupa of Wat Chang Lom guarded by remains of life-size stone elephants across the broad and immaculately-tended lawns to the grandiose stupa at Wat Nang Phaya. 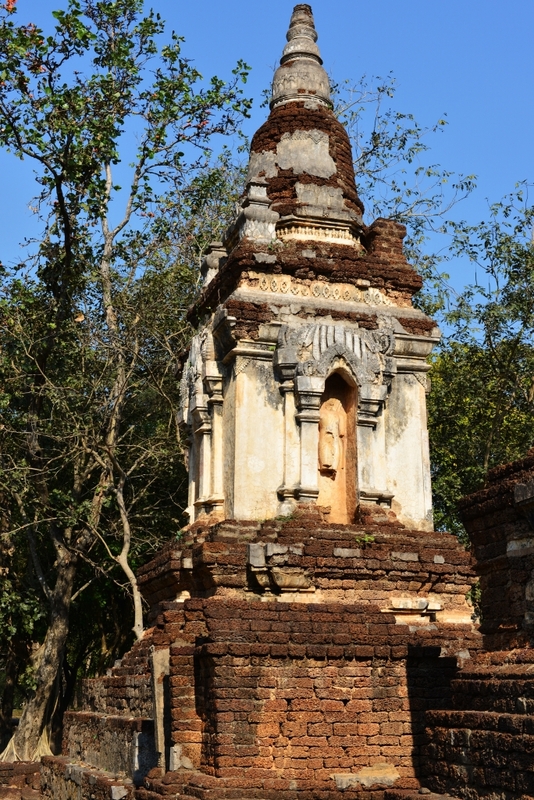 Si Satchanalai was incepted in the late 13th century by the Sukhothai kingdom as bulwark against the Burmese. 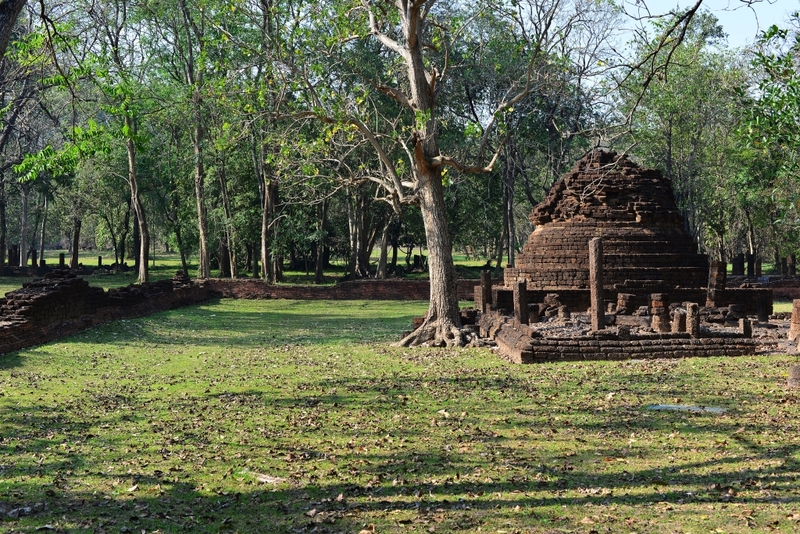 Wat Chang Lom is centered on a large manicured green field, the ring of stone elephants remains facing outward from the lower chedi wall, the tiers of the structure building to its ultimate spire, the remains of the vihara to the front affording dramatic vistas from the far entrance towards the bulbous form of the stupa. The entrance of Wat Chang Lom faces Wat Chedi Chet, whose bristling cream chedis represent the culmination of Si Satchanalai’s elegant serenity, the brilliant sunshine filtering through the broad canopies of the mature trees and shimmering of the surfaces of the ancient temple remains. 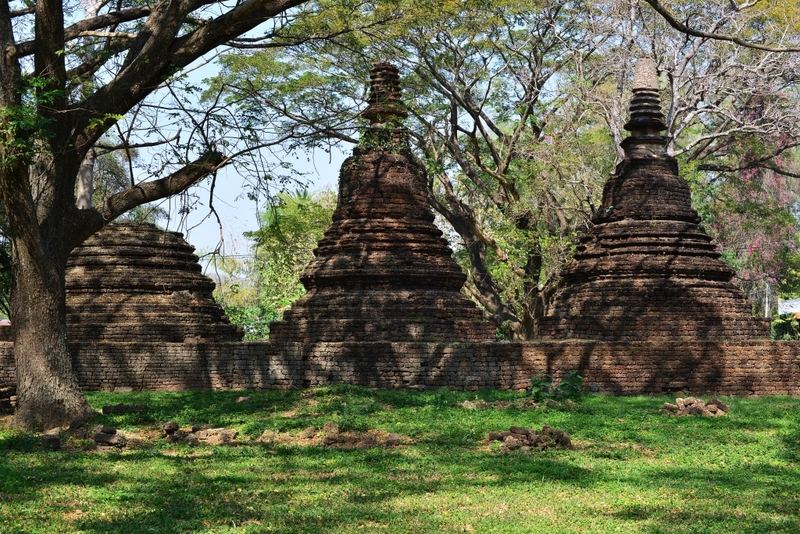 A low wall encircles a belt of bristling chedis of relatively complex design that encompass the remains of a vihara and center on a much larger stupa that looms over the entire arrangement. 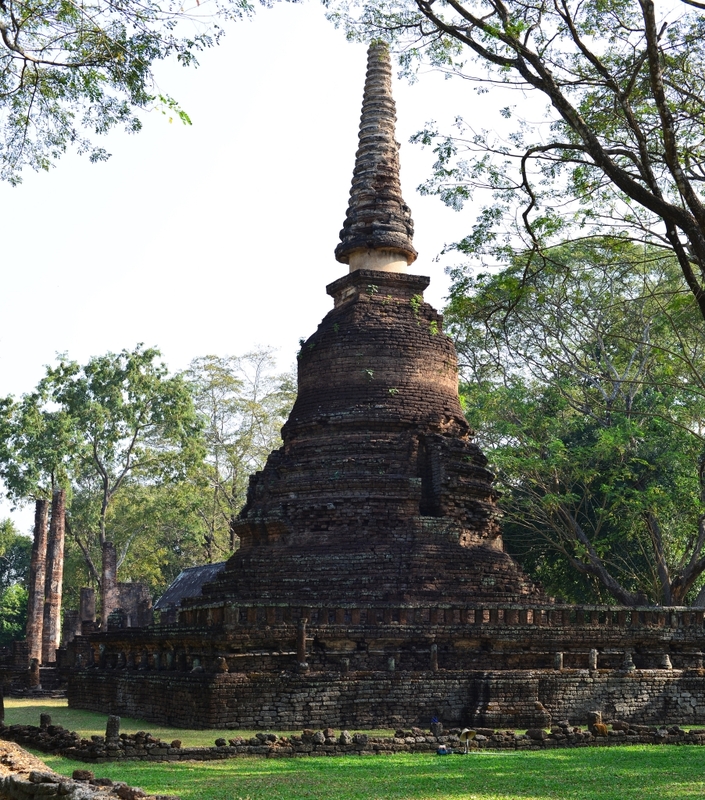 The English tour group I had crossed paths with at the prior temple is now meandering slowly through Wat Chedi Chet, evidently taken by its compelling drama and beauty. Adjacent the large stupa nestled amongst the vihara column remains is the single one intact wall fragment at the site, embellished with delicate floral patterns housed in geometric form and accompanying the thick stone columns that buttress the windows, draped in similar filigree artisanal brilliance. While I am thrilled to have been able to make it through the bulk of the site, perhaps having missed some of the less important temple remains shrouded amongst the broadly spaced tree giants, I don’t want to risk missing the last bus at 4:30 pm. I could imagine spending a number of days wiling away the time at one of a number of atmospheric homestays I have seen ambling along the country lanes. An older Swiss couple and their young daughter speaks with me in German, English too much of a departure from their entangled dialect, here on a two week whirlwind tour of the country. The young woman is gregarious and speaks English and high German the best, her mother calm and relaxed, and father somewhere reticent, with a touch of surprised whimsy. We wait for some time for the bus, not surprising considering the number of stops sustained on the trip north. The neurotic Englishman I saw earlier at the temple now joins us, skittishly buying a satchel full of junk food and focusing his attentions entirely on the young woman, his impeccable Oxford English belying his social ineptness at ignoring the rest of us. The bus finally arrives and I nod off occasionally, a constructive way of passing the travel time. The ubiquitous group of young uniformed schoolchildren files off the bus, the behavior simply shockingly correct by North American standards. We are loaded onto a tuktuk into town, the driver charging us 30 baht each by the head. I am actually surprised that the drivers are so ethical here – especially given that I was avoiding tuktuk and taxi drivers for this reason. Not that the real cost of taking these vehicles wouldn’t substantially negatively impact my tight budget. 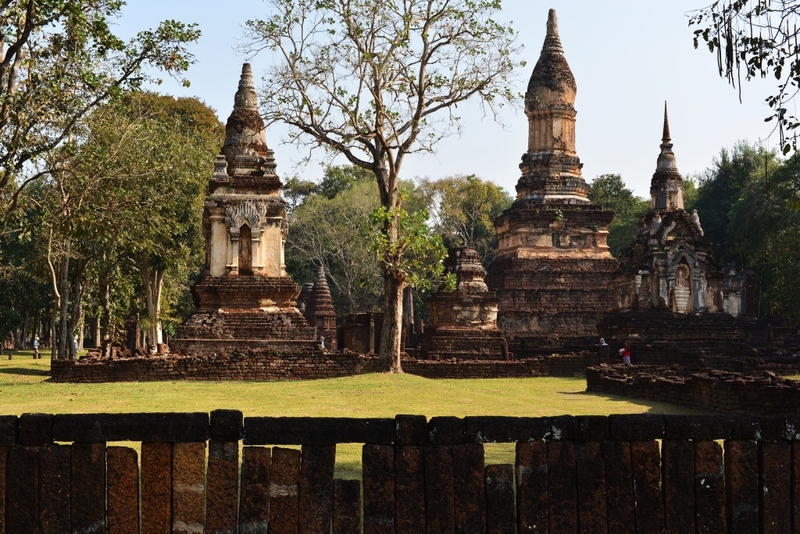 Elaborating as to why the family will not be visiting the temples at old Sukhothai, the young Swiss woman asserts that they just didn’t want to go to places that were overrun with tourists, and wanted to have a genuine experience of a place. She had been really disappointed by the crowds of people she had seen in Mexico and did not want to repeat the experience. I would like to tell her that if she wants to avoid the crowds of tourists she should probably stay at home or move into a cave, but bite my tongue – whatever people believe to be seeking on a trip is fine, as long as they aren’t hurting anyone. Something gives me the feeling that she probably commandeered her parents into this particular form of trip, as they don’t seem particularly concerned about such minute details. We are deposited in front of their hotel in the new city, but not having ventured into town before I really have no idea as to where anything would be. I see a few restaurants both indoors and out, the high prices of the rather drab-looking pizzeria and the incomprehensive English menu and accompanying feral dogs repelling me from the terrace of the other. Already I see the tendrils of the night market spreading through the dusking streets, the modest stalls making snack foods leading to the roadside single-burner eateries from which emanate the occasional rank odour and little possibility of creativity, but then it occurs to me that the quantity of farang eating at them can’t be wrong. The most popular turns out to feature a very well-equipped and inexpensive menu of local foods that are well-prepared, tasty, and as good as anything you could get for the price (30 baht per dish). Looking at the crowds of tourists milling around the night market in the new city I can only imagine that there are a lot of accommodation possibilities that don’t achieve any kind of presence on the net.